As in all states where hunting is a popular pastime, Ohio deer hunting regulations are strictly regulated by the Department of Natural Resources Wildlife Division. Laws and regulations are set in place for the preservation of deer for future hunters, as well as for the safety concerns of current hunters. 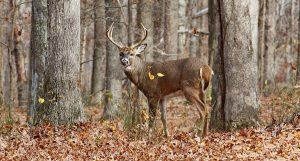 What you need to know to take part in Ohio deer hunting? First of all, you will need a hunting license, and to obtain a license in Ohio, you must successfully complete a hunter education court. This can be satisfied by taking the course, presenting a previous hunting license from any other state, or signing an affidavit stating that you are over 21 and have previously held a hunting license. There is no minimum age required for a child to begin hunting, however, the education course is written on a fifth grade level. All children 15 or younger who wish to take part must always be accompanied by a licensed adult at least 18 years of age. The methods of Ohio deer hunting are also strongly regulated. Legal weapons include any caliber handgun, rifle, a shotgun that is 10 gauge or smaller, airgun, longbow (must have a draw weight of at least 40 pounds), or crossbow (must have a draw weight between 75 and 200 pounds). Trapping and spotlighting are illegal, and the use of voice transmitting devices in hunting or taking are prohibited. No motor vehicles aside from boats and farm equipment are allowed as a means of Ohio deer hunting, either. For safety purposes, all hunters must have some form of visible orange clothing during open season to be seen by other hunters. As with most states, Ohio is regulated by season, as well as by hours. For the safety of all, guns may not be fired before dawn or after dusk. Because of the popularity of hunting various animals throughout the rotating seasons, there are even regulations set for the use of wildlife areas. Between September 1st and May 1st, these areas are closed to anyone not participating in Ohio deer hunting or other hunting and fishing opportunities between 8pm and 6am and between 10pm and 6pm for the remainder of the year. This means that only hunters can camp overnight, reducing the hazards of anyone not wearing the needed orange being harmed. One interesting aspect of the Ohio deer hunting regulations are that they assure no deer is killed for just the sport of it and that there are organizations set up for hunters to donate a portion of their venison to those in need, helping to fight hunger. In this manner, no kill is wasted.